VANCOUVER — It was New Year’s Eve and somewhere Mr. Worldwide was ready to party. 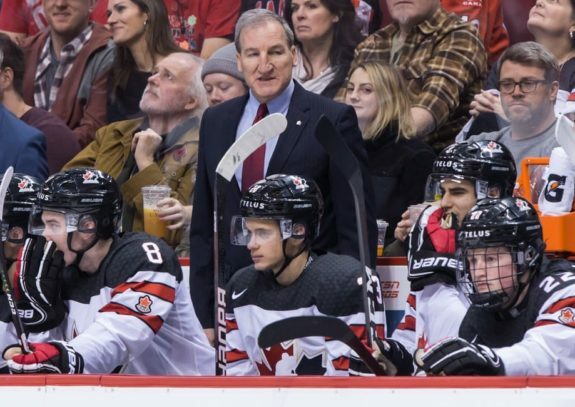 Cody Glass didn’t keep Pitbull waiting long, snapping a shot home just two minutes 20 seconds into the first period to spin Canada’s goal song — Don’t Stop The Party — as the hosts opened the scoring for the fourth straight time at the IIHF World Junior Championship. And for the 23rd time in just over 182 minutes of hockey, the rapper’s catchy tune had Rogers Arena rocking again. Canada had outscored its three previous opponents 22-3 ahead of facing Russia in a first-place showdown between unbeaten teams in Monday night’s round-robin finale. The celebration started early for the 17,556 fans in attendance, hoping to ring in 2019 by ringing up the Russians and locking up top spot in Group A for an easier matchup in Wednesday’s quarterfinals. Unfortunately for that capacity crowd and for Team Canada, this party also ended early — long before midnight. Turns out, Russian goaltender Pyotr Kochetkov is no fan of Pitbull — preventing him from playing again with a superb 30-save performance — Grigori Denisenko put those plans on pause by netting the equalizer before the first intermission and Pavel Shen played spoiler by scoring the go-ahead goal 11 minutes into the third period on a great individual effort that stood up as the winner in a 2-1 victory. “It’s a tough loss, but we’ve got to move on,” said Team Canada captain Max Comtois. “We have to believe. It’s only one loss, we’re not out of the tournament. We’re going to have the chance to play in two days in the quarters and still battle for a medal. . . .
“We’ve got to stay positive. It’s only a loss, we’re not out,” he later reiterated in the same postgame scrum. 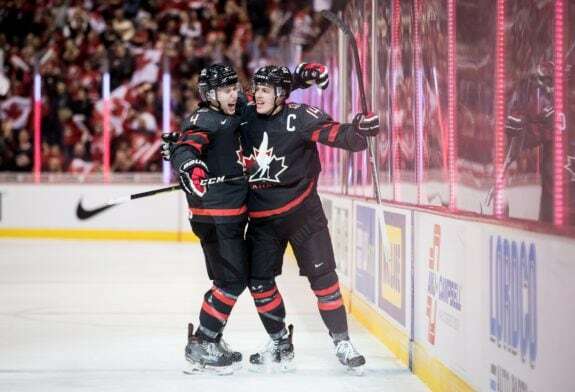 The celebrations were short-lived for captain Max Comtois and his Team Canada teammates on Monday. Comtois put forth another feisty effort and came close to breaking a 1-1 tie during the second period, but Russia went on to win 2-1. As a result, Russia gets top billing and draws fourth-seeded Slovakia from Pool B, while second-seeded Canada awaited the loser of Monday’s late game from Victoria where Finland fell 4-1 to the United States. “Adversity was going to come and we’re happy it came now,” said Canadian forward Owen Tippett. “We’re just going to recharge and get ready for the battle (against Finland). Wednesday’s other quarterfinals will feature the Americans against the Czech Republic and Pool B winner Sweden against Switzerland. The semifinals are slated for Friday, with the medal games on Saturday. From now on, it’s must-win mode for Canada and all eight of the remaining teams in medal contention, while Kazakhstan and Denmark will play off in the relegation round. Asked what Canada has to do different going forward into elimination games, defenceman Markus Phillips responded: “Nothing. We just have to play the Canadian way — that’s the biggest thing — and we just have to play for a full 60 minutes. Glass kept the trend going of Canada scoring first in every game by firing low glove on Kochetkov, but Denisenko responded for Russia on a power play at 5:21, blasting a one-timer past Michael DiPietro on a cross-ice feed from Vitali Kravtsov. For Glass and Denisenko — both first-round NHL draft picks by Vegas and Florida, respectively — those were their second goals of the tournament. The score stayed 1-1 through the first intermission, with Russia capitalizing on the lone man-advantage situation of the opening frame — the result of a soft checking-from-behind call on Morgan Frost that also came with a mandatory 10-minute misconduct. The two youngest players on the ice were two of the best — or two of the most engaged — in the first period. Alexis Lafreniere for Canada, the potential No. 1 pick in 2020, and Vasili Podkolzin for Russia, a likely top-five pick in 2019, were buzzing and made positive impressions. Lafreniere, still being deployed as the 13th forward, stood up big Russian blueliner Alexander Alexeyev on an attempted hit to end a solid shift in the offensive zone, while Podkolzin had one of the more dangerous rushes in shooting high over the net during one of two 4-on-4 situations. Both Lafreniere and Podkolzin are 17-year-old forwards playing in a primarily 19-year-old tournament. Team Canada head coach Tim Hunter limited Alexis Lafreniere’s ice-time over the final 40 minutes. The youngster, seen here at the right end of the bench, didn’t have a chance to be a difference-maker. Lafreniere was quiet the rest of the night and seldom used in a scoreless second period, but Podkolzin remained the centre of attention — more so for his physical exchanges than his offence, but he was arguably the most noticeable player on the ice through 40 minutes. Noticeable with the full cage as an underager, but something was happening every time No. 11 was out for Russia. Podkolzin was on the receiving end of the game’s hardest hit from Canada’s MacKenzie Entwistle — which could have been called interference since Podkolzin didn’t have possession of the puck — but after staying down for a bit, the kid picked himself up, got in on the forecheck and finished a decent hit of his own to end another eventful shift. He also took a roughing penalty that carried over 36 seconds to start the third period. If Podkolzin wasn’t the most noticeable player through two periods, that title would go to Kochetkov — the 19-year-old undrafted goaltender who kept it a 1-1 deadlock with two sensational saves. First, he got across to rob Comtois with a left-pad stop at the four-minute mark, then Kochetkov stoned Ty Smith from the slot by kicking out his right pad just past the midway point of the middle stanza. Kochetkov continued to kick in the third period, but perhaps got in Canada’s head a bit too. The Canadians were guilty of getting too fancy in the final frame and failing to get many shots on net despite having the bulk of possession time. 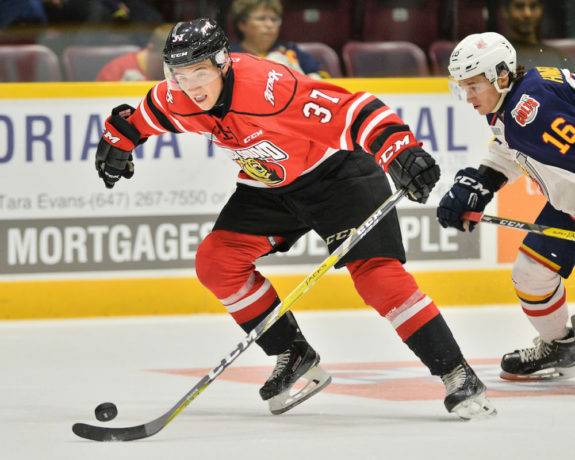 Nick Suzuki tried not one but two toe-drag moves to no avail — wasting a 2-on-1 break with Brett Leason on the first overhandle — and Tippett attempted a between-the-legs shot from the side of the crease that was deflected out of play by a Russian defender with 31 seconds remaining in regulation. Canada already had the extra attacker on at that point and though it looked pretty, it was another low-percentage play with better options available. Nick Suzuki is a high-skill player who has pulled off some sweet moves that worked in these World Juniors, but he should have simplified his game against Russia, especially when trailing by one goal in the third. Russia iced the puck with 12 seconds left and then Shen took a delay-of-game penalty for smothering the puck with 5.8 ticks to go, but Canada couldn’t get the puck to the net from either of those offensive-zone faceoffs and the clock ran out. Prior to that somewhat anticlimactic finish — with no Jordan Eberle-esque heroics to speak of on the 10-year anniversary of his dying-seconds equalizer from a much more epic Canada-Russia clash — Kochetkov did make another key save off Entwistle’s quick shot from the low slot on a bang-bang chance with 3:07 remaining that amounted to Canada’s best opportunity of the third period. The better chances came at the other end, with Russia outshooting Canada 13-9 in the third period and getting the only goal from Shen. That play — which started with Shen wheeling through the neutral zone before driving wide around Phillips, cutting across the crease and tucking the puck inside the far post — will probably be immortalized on Russian highlight-reels for the next decade now, the way Eberle’s has been here. Especially if the end result is the same — a gold medal. Denisenko nearly made it 3-1 for Russia with about seven minutes left when his harmless-looking shot off the right wing squeaked through DiPietro, went off the post and out the other side. Still down by one, Canada tried to put on the full-court press in the final five minutes, but that attacking mentality was cause for a couple chances in the other direction as Kirill Slepets got behind the Canadian defence for a clear-cut breakaway that DiPietro turned aside with a clutch pokecheck. Before his shift was through, Slepets burst into Canada’s zone again but ripped that shot well wide. DiPietro certainly wasn’t to blame with 29 saves, just one fewer than Kochetkov in this goaltending duel. DiPietro gave up some early rebounds of concern but settled in and should continue to backstop Canada into the medal round. The Czechs got back in the win column and got their go-to guys on the scoresheet, while the Danes came close a couple times but were blanked for the fourth straight game — failing to score a goal through the round-robin portion and finishing fifth in Group A.
Martin Necas, the Czech captain, had a goal and a primary assist, Martin Kaut also scored, his second of the tournament, and Filip Zadina finally notched his first point with a helper on Necas’ power-play marker. 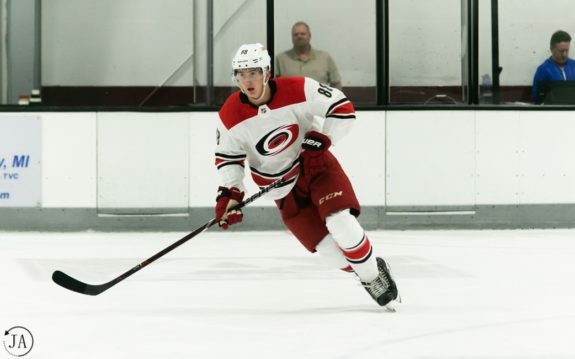 The Czech Republic needed more from their captain Martin Necas — a Carolina Hurricanes first-round pick — and he delivered with two points in Monday’s 4-0 triumph over Denmark. Jakub Lauko opened the scoring in the first period on a terrific feed from Krystof Hrabik and defenceman Filip Kral netted a shorthanded goal in the third period, while Lukas Dostal was stellar again in pitching a 20-save shutout. Denmark captain Jonas Rondbjerg, a Vegas draft pick, nearly set up his country’s first goal of the tournament on a power-play rush, but Dostal sprawled out for a spectacular save to keep the Danes’ goal song a mystery into the relegation round against Kazakhstan. Mads Søgaard, who plays for the WHL’s Medicine Hat Tigers, had his best showing of the tournament thus far with 30 saves for Denmark, including a diving stop to deny Zadina of his first goal. Zadina had seven goals in as many games at last year’s World Juniors in Buffalo — tying for second among tournament leaders — but he’s 0-for-4 through the round robin here. That’s the bad news, but the good news for the Czechs is that they are through to the medal round as the third seed in Group A with two wins and two losses to finish ahead of Switzerland.